We spent the day at the Farnborough Airshow also known as the Farnborough International Exhibition and Flying Display. 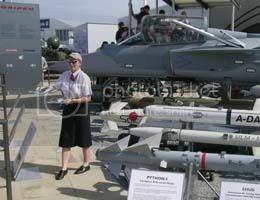 It's run by the Society of British Aerospace Companies primarily as a trade show for them to show off their wares. From Monday to Friday it's trade only and then it opens up to the public on the weekend. There's a few civillian aircraft but it's really about military aircraft and capability. It's a place where government reps come pushing shopping trolleys. It felt pretty sickening looking at some of it and reading the marketing material. 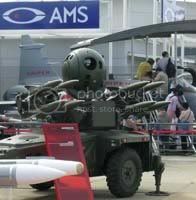 The really scarey stuff was the remote controlled surveillance, targetting and attack aircraft. Are you in the market for a "Lethal Node" that can "Achieve the Needed Effects"? The progression of the aircraft technology is amazing. You don't need or want humans in the aircraft anymore; they're the weakest link. The unmanned surveillance aircraft can patrol at a huge height for 36 hours. You then send in remote controlled targetting helicopters (sorry, no picture) to confirm and pick the targets which are destroyed by small fast remote controlled attack aircraft. Allows you to fight a war without the messy business of losing men on your side. Politically, it's a winner. Ignoring my conscience about being around this trade show, I admit I did enjoy the air displays. For five hours, there was something roaring into the sky and struting it's stuff. There's a list on the official website but it included a B52H Stratofortress, Chinook, Apache, B-1B Lancer, Airbus A340-600 (longest plane in the world), Hunter F6a, Gnat, Spitfire V, P-51D Mustang, C103 tranporter, Tornado, F16, F117A Nighthawk, Eurofighter (Typhoon) and many others. The Eurofighter put on a particularly good display but my favourite is still the good ol' Harrier jet. It's just very cool to watch a jet come screaming in, put on the brakes, stop in mid air and then proceed to float about. Of course, the show finished with a display by the Red Arrows in their Hawk T1A's which is always good. I'm sure the kids found the airshow memorable. They bought some postcards and will send a couple off. K* says his next project is to build a Nighthawk out of Lego.